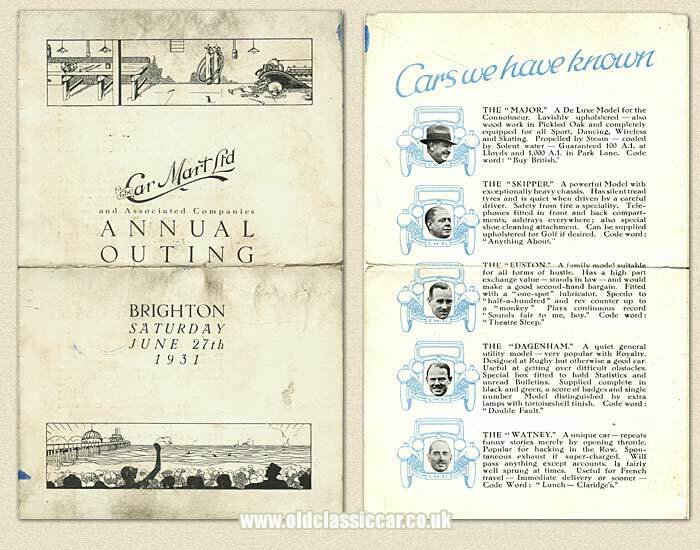 Pre-war items relating to The Car Mart Ltd dealership in London. Homepage. This page: Paperwork that relates to The Car Mart, a once well-known London motor emporium. The Car Mart Limited Annual Outing to Brighton. Firstly, a slightly grubby but nonetheless interesting item that turned up a while ago. This folded card, measuring 8"x5", was handed out to employees of The Car Mart Limited (and Associated Companies) on their annual day out in 1931. This year the destination was Brighton, whether this was the case every year or not I don't know. The cover of the card shows a workshop, devoid of any mechanics, with a half-finished motor-car up on jacks, with just a couple of tiny mice for company! Clearly the workers had already boarded the coach bound for Brighton. Inside the cover, and shown above right, was a light-hearted description of some of the 'cars' they'd experienced. The inclusion of various people's faces suggests that this was a gentle ribbing of certain Car Mart employees, probably the management. For example, "The Major", a "De Luxe model for the Connoisseur. Lavishly upholstered - also wood work in pickled oak and completely equipped for all Sport, Dancing, Wireless and Skating. Propelled by steam - cooled by Solent water - Guaranteed 100 A.1 at Lloyds and 1,000 A.1 in Park Lane. Code word: Buy British". The "Skipper" was described somewhat unflatteringly as having an ".. exceptionally heavy chassis .." with ".. ashtrays everywhere ..". The "Watney" had several dubious features too, such as ".. spontaneous exhaust if super-charged ..". On the opposite side of the sheet, the 1pm menu for their meal, scheduled to be at 1pm on June 27th 1931, at The Aquarium Restaurant in Brighton. Various tasty delicacies were on offer, including fillet plaice, lamb, roast beef and Yorkshire puddings. Air - "I Love a Lassie"
So please don't mention "Shop" to-day. To the drill and to the bit. Till it's time to go back again. Does anyone remember The Car Mart Limited? The company can trace its roots back to 1908, and was approved agent for the sale and service of many familiar motor-cars of the day, including Austin and Rolls-Royce no less. Kennings took the firm over in 1968. The Car Mart Limited was formed by a Major R.S. Grigg, possibly the 'Major' referred to in the 'cars we have known' skit shown above. Enclosed with the above leaflet, is this small single sheet as shown below. Signed by R.S. 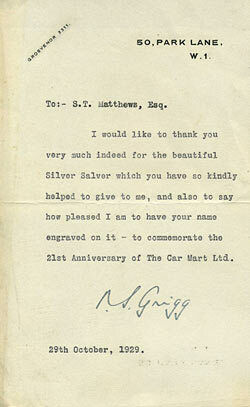 Grigg, it refers to a silver salver that had been produced to celebrate The Car Mart Limited's 21st anniversary, in October 1929. Also well-thumbed is this letter, sent by The Car Mart's Sales Manager A.P. Field in 1937 to a prospective customer for an Austin commercial vehicle. 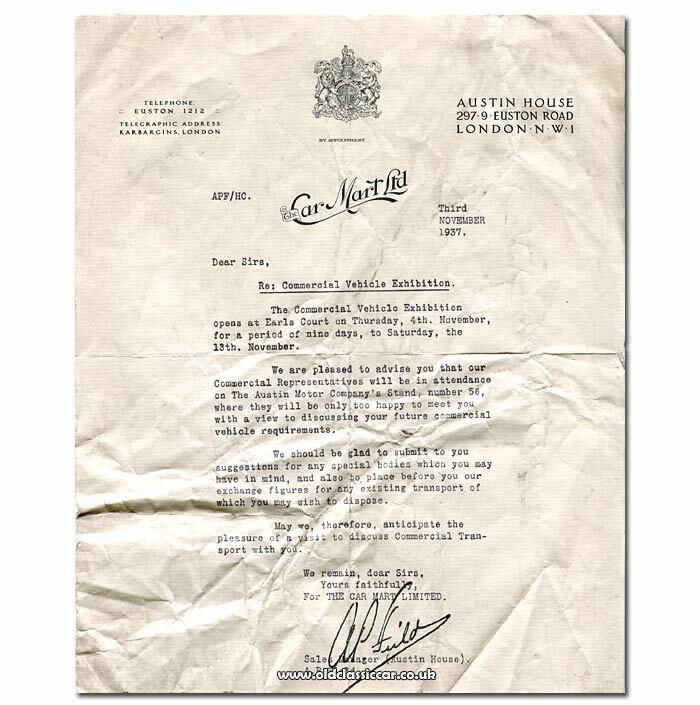 In it, Mr Field advises that representatives of their emporium would be attending the Commercial Vehicle Exhibition at Earl's Court, and may be found on the Austin Motor Company's own stand. Dates for the exhibition were the 4th to the 13th November 1937. The letter-heading mentions the company's very appropriate telegraphic address ("Karbargins, London"), and their actual address, which was Austin House, 297-279 Euston Road, London NW1. Who the letter was actually sent to though isn't mentioned.